Hangers do the task of suspending and holding something. Pipe hangers are designed to support both insulated and non-insulated pipes. They make it possible to make limited movement and vertical adjustment in the piping system. There are some types of pipe hangers that we’ll discuss later in this article. Besides, there are also supports and clamps, which together with pipe hangers, provide support for hanging pipes. They are mostly used for suspending both insulated and non-insulated pipes. Their design avoids getting pinched during installation and features aligned bolt holes that facilitate quicker overhead installation. They have their variations that are suitable for the suspension or adjustment of light stationery, cast iron, or ductile pipes. They can suspend both insulated and non-insulated pipes and provide support for single conduits by hanging and side mounting. They reduce vibration and noise, and some of them are also able to prevent the transmission of electrolysis between the hanger and the pipe. Besides, they feature side holes for easy wall mounting. They are suitable for the suspension and vertical adjustment of copper tubing. Just like the J hangers, they prevent electrolysis between hanger and tubing with their plastic coating. You will see the use of these hangers in fire sprinkler and other common piping purposes. You can adjust them even after the installation because of their knurled swivel nut design. Besides, their flared edges protect plastic pipes from scratches and scuff along with making the installation process easier for all types of pipes. Just as the name suggests, they provide support for heavier pipes. They are widely used in trapeze installations for providing support for the trapeze assembly. The bolt hangers allow suspension and vertical adjustment for copper tubing while the ring hangers are suitable for providing support to lightweight non-insulated pipes. Widely used in automatic fire sprinkler systems, these hangers attach pipes to wooden beams where the latter is not supposed to be contracted. They look like a U-shaped metal fastener. The roller hangers provide suspension and allow horizontal movement for the pipes. On the other hand, the split hangers are open in the center and clamp around a pipe. They are the ideal option when you need to run the piping system close to walls or ceilings. 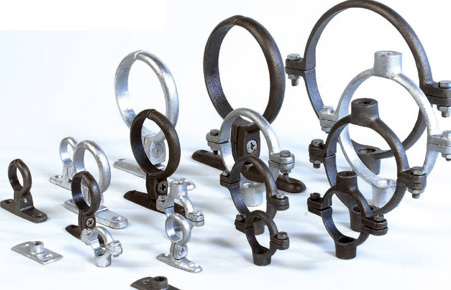 Apart from these types of pipe hangers, different kinds of supports and clamps are also available for piping systems. You have to choose the right devices for a particular system to keep the pipes functional and protect from damage.